Services – all the SaaS content packs can be found here. Files – importing Excel or Power BI Designer files, start here. 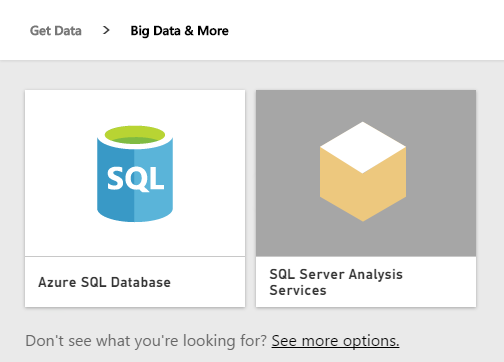 Big Data & More – connect directly to your On-Premise SQL Server Analysis Services or Azure data sources. Samples – start with a sample content pack focused on retail sales. After you click on the type of data you want, you’ll be taken to the full list of content found in the selected group. Let’s take a quick tour of each group. 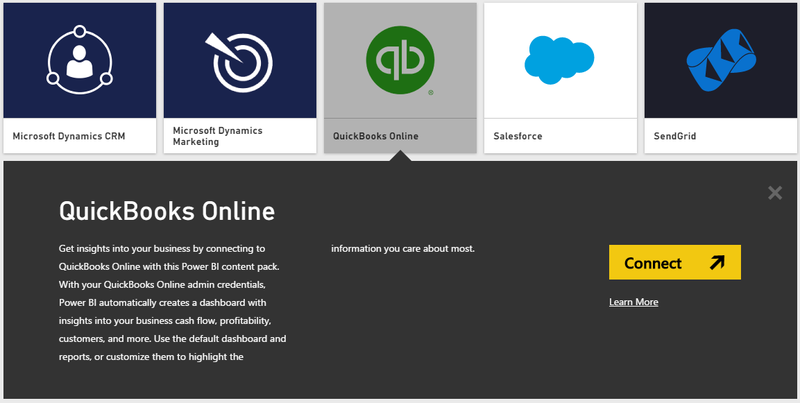 In this group, you’ll find all the out of the box content packs for the most popular SaaS services supported in Power BI. This includes QuickBooks Online, Salesforce, Google Analytics, Microsoft Dynamics CRM, and many more. Each service has an icon making it easy to identify. Once you find the service you’re interested in, click on the tile and you’re presented with a small description along with the Connect button. If you want to find out more, click on the Learn More link and you’ll be presented with detailed information about the specific service and content pack. Once you click the Connect button you’ll have a beautiful dashboard with supporting reports providing you detailed insight into your business data. Customize the dashboard and reports to get exactly the view you want! Importing your Excel data and Power BI Designer reports continues to be very easy under the Files section. You can import these files from your local computer and your OneDrive for Business or OneDrive Personal accounts. Importing data from OneDrive makes it easy to ensure updates to the data can be refreshed in Power BI. This means you and your co-workers, using the latest view of data, can make decisions about your business. 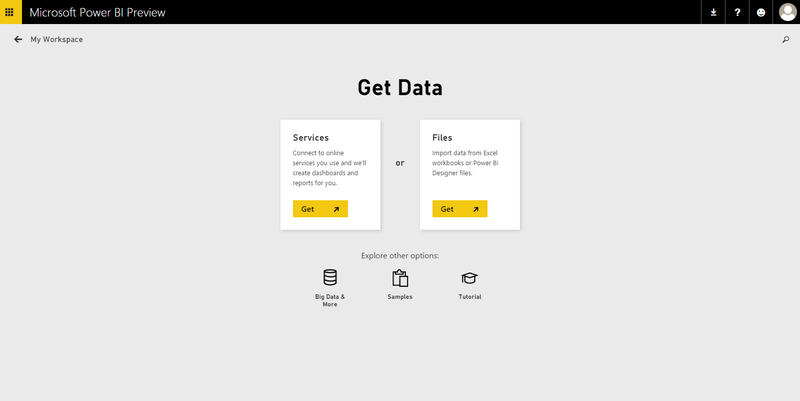 After you select the storage location of your files, you will then browse and select the specific file you want to import into Power BI. Start exploring the data by clicking on the new dataset you’ve added or ask questions using Power BI’s Q&A natural language service. Pin the insights you find to your dashboard and you start monitoring the health of your business. Connecting directly to your on-premises Microsoft SQL Server Analysis Services or Azure data sources is as easy as clicking a button and entering your credentials. Once complete, you can begin to explore your data, build reports, and pin visuals to your dashboard. 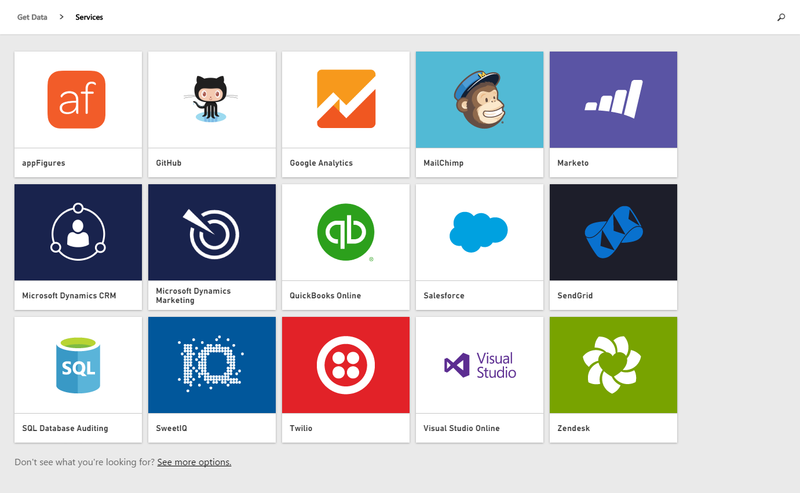 As you play with the new layout, send us feedback and additional feature requests via http://support.powerbi.com. And stayed tuned as we continue the weekly cadence of updates. It’s going to be really exciting in the coming weeks!